Hi everyone! Yes, I am still here. I am sorry I have been low on posts. Everything around here is a bit low right now, I guess it's those last few weeks of summer. I am low on ideas, low on supplies, and low on umph. I think the kids are wearing me out. But, I am still here and still looking around. When I find something good, I'll be sure to share it. I pulled this creation off yesterday. It was my son's birthday party with family. We were actually celebrating three different family birthdays so I said I would do cupcakes instead of a cake. The birthday is Sunday and on Saturday I got this idea that, "Maybe I could create something with the cupcakes." 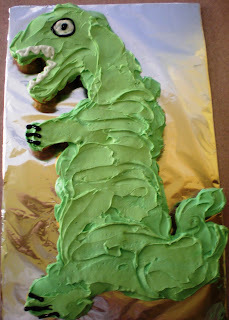 During one of the children's birthday parties at school last year they brought in this great fish cake. It turned out it was a cake of cupcakes. I thought it was really neat, but not something I could do. Well, guess what? It wasn't that hard. I used one cake mix and two containers of pre-made icing, (remember I am not a kitchen aficionado). I made mini-cupcakes with the cake batter. I then got a long piece of cardboard and covered it with aluminum foil for my "tray." Then next step was to take all the cupcakes and make a shape with them. My son loves dinosaurs, so I shaped a T-Rex--no patterns, no pictures to copy, etc., just a general shape. Then I colored the icing green and iced over all the cupcakes. You use more than the regular amount of icing because you are filling in space also. After the cupcakes were iced I drew and eye, teeth, and claws with decorating gel. I thought he looked great, but so did everyone else, so I thought I would share. Try it. It's not hard and sooo easy to eat and serve--tastes great too! Looks great! I may have to try this for Lu's 4th BD is Sept. Thanks! I'm feeling the summer slump too! I know how you're feeling. It's our last week before school starts and I am so low on energy. I pray that I muster up energy for the last few days I have with them and for the first days of school! CUTE cupcake cake!